A midwife examines a pregnant woman at a health clinic near Moyamba, Sierra Leone. The United Nations World Health Organization (WHO) has introduced a new prenatal care model, designed to enhance pregnancy the experience for women, and reduce the risk of stillbirths and other complications. According to the WHO, last year around 303,000 women died from pregnancy-related causes, and 2.7 million babies died within the first month of life, in addition, 2.6 million babies were stillborn. Antenatal, or prenatal, care enables health providers to deliver critical care to pregnant women, including good nutrition, family planning counselling, and healthy lifestyle promotion. WHO developed the new recommendations on antenatal care to enable women to have more contacts with their health care providers throughout their pregnancy. According to recent evidence, this model is expected to reduce likelihood of still births, due to providing more opportunities for health care providers to detect and manage potential problems. By example, the agency noted that a minimum of eight contacts for antenatal care can reduce perinatal deaths by up to eight per 1,000 births, when compared to a minimum of four visits. “More and better quality contacts between all women and their health providers throughout pregnancy will facilitate the uptake of preventive measures, timely detection of risks, reduces complications and addresses health inequalities,” said Dr. Anthony Costello, the WHO Director of Maternal, Newborn, Child and Adolescent Health. “Antenatal care for first time mothers is key. This will determine how they use antenatal care in future pregnancies.” WHO predicts that the new model also increases maternal and foetal assessments to detect problems, increases the likelihood of positive pregnancy outcomes, and improves communication between health providers and pregnant women. “Counselling about healthy eating, optimal nutrition and what vitamins or minerals women should take during pregnancy can go a long way in helping them and their developing babies stay healthy throughout pregnancy and beyond,” stated Dr. Francesco Branca, the Director Department on Nutrition for Health and Development, WHO. In addition, the agency aims to provide flexibility for countries to adopt the new antenatal care model, and adjust it to their specific needs. 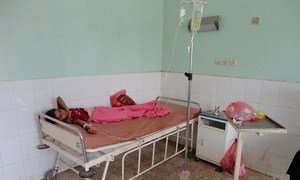 There are critical shortages in medical doctors in over 40 per cent of all Yemeni districts, with more than half of all health facilities closed or partially functioning as the conflict continues, a new World Health Organization (WHO) survey has revealed.